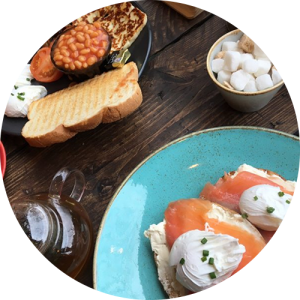 19 café bar is an independent coffee shop bringing Brooklyn café culture to Manchester’s Northern Quarter, with delicious pancake stacks, open bagels and more! Our philosophy is simple: great food, a cool vibe, and interesting drinks, at great prices. 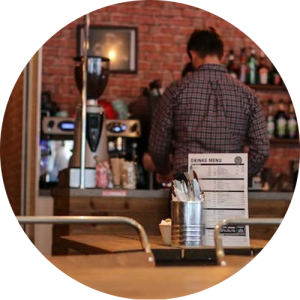 Open 7 day a week, serving locally roasted coffee from Heart and Graft, along with a fresh and exciting brunch menu using locally sourced ingredients including “the best sausages in town”. We offer a friendly and cosy environment and a selection of cakes and homemade brownies to go with any brew we do. Choose a booth, a window table, or sit outside when the weather allows! We are also a fully licensed bar enabling you to enjoy an Espresso Martini or something a little different with your brunch. 19 Cafe Bar is available to rent and is a great place for events and more, with our friendly staff to delicious food and drink, we’ve got it covered. Please get i touch with us for more information and to check availability, we will look after you and your guests what ever the occasion. Great little place, by far the best cakes in Manchester, plus artisan sausage rolls and great weekend brunch with pancakes and avocado/bacon on toast etc. Spotlessly clean and the staff are lovely. There's a nice mixture of traditional tables, sofas and outside tables - one of the few places where you can have a coffee or soft drink and a light snack outside in Central Manchester. Amazing little gem in the NQ. A bar where you can actually hear each other talk and the cocktails are amazing! Cosy atmosphere - I’ll definitely be back here soon. A nice restaurant with great choice of food and drinks. The staff are very helpful and friendly. Thank you so much for the beautiful food brought into our N Brown offices today the response was great everyone loved it. Thank you again will definitely be seeing you in the future.